Social Security COLA does not keep up with real inflation … really? 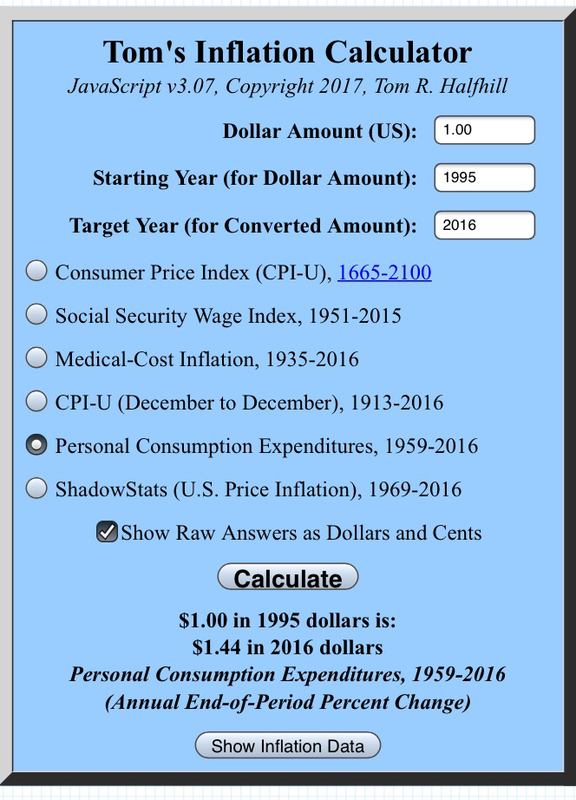 Since 1995 the Social Security COLA has increased each dollar of benefit from $1.00 to $1.60. Since 1995 the CPI has increased at the same rate. In addition if you look at the PCE (1) which is used by the Federal Reserve, you find that the COLA increases have exceeded that measure. Plus the PCE gives greater weight to health care costs. So the general assumption that the SS COLA is way off base is not accurate. Even using the CPI-E for elderly people only changes the calculation by 0.2% over time according to the Social Security Chief Actuary, and based on past history can be lower than the CPI-W (which is used today for the COLA) in a given year. Why are you choosing to beat up on retirees? You are an idiot if you think the COLA is keeping up. Poor fella can’t go to a restaurant one time because it would cost too much. Auto repair cost are not up 60 percent. More like 160 percent. Car parts. Rents are crazy. Food is through the roof. More and more you see individual items swing wildly higher. What do almonds cost these days? More and more these people get to choose from less and less as more and more items explode in price. Utilties seem to remain reasonable…at least in my area of Florida. Oh boy, if you make one mistake and get a driving ticket…you are screwed. No way would you ever be able to afford an attorney for anything. Your argument is just dumb. All you have to do is talk to any retiree depending on social security. Furthermore, you are a real jerk for beating down people who for whatever reason ended up on the bottom. What a jerk. I’m not beating down on anyone. I merely presented some facts from various sources which you choose to ignore. You mention several possible expenses, but the reality is a person won’t incur many of those regularly if ever. I’ve been retired eight years I know what prices change, but while I receive SS I don’t depend on it as my main income source, on the other hand my pension has no COLA and never will. Dwayne – I was looking at the 1995 price of gasoline, @ $1.15 since that is the year in the story, picking 1981 means nothing to me. I also, remember paying 99 cent per gallon of gas in 1995 in MT. Look at 1974 the year I graduated high school minimum wage was $2. 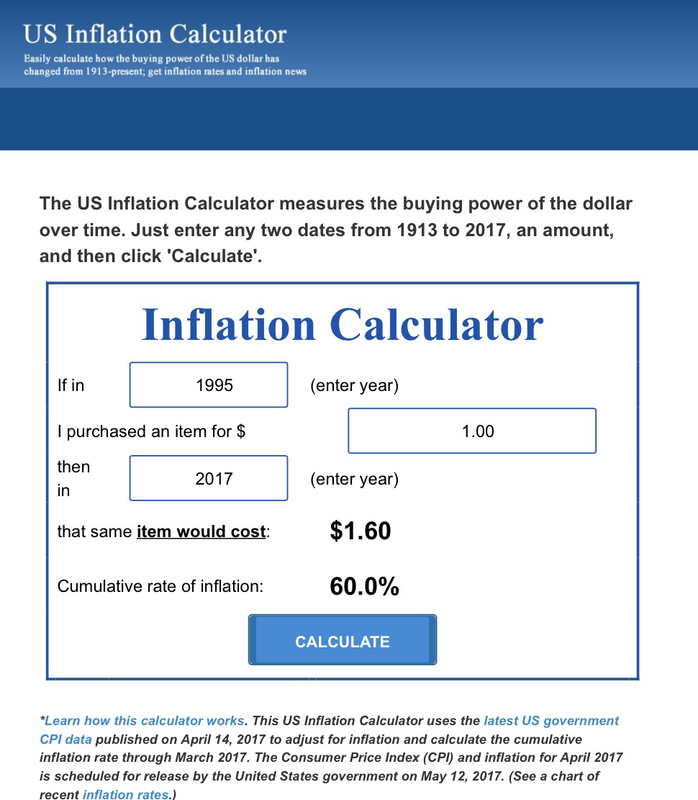 My first job paid me $2.85 per hour and the inflation calculator shows that $2.85 had the buying power of $14.85 in 2017. So maybe we should increase the minimum wage, that has not been raised since 2009. I stand by my points the current COLA formula is faulty. So you would double the minimum wage every time a single commodity swings wildly due to world events such as the 1973 oil embargo? Besides causing runaway inflation and job lost, which it did by the end of the decade, do you also propose to cut the minimum wage every time a single commodity (which fits exactly what you buy everyday but not your neighbor’s) or should it be a policy of never cutting entitlements like it is now? Where would it stop? Gas prices are less now than in 1974, less cut the COLA. Yes the COLA formula is faulty but the government has to pick a method and stay with it or the data will be useless over time. High gasoline prices drive inflation, which prevents somebody from buying a durable good (say a clothes washer) and then the factory closes or moves to Mexico, and now that person can’t buy food or housing on their wages. For the past 30 years, I have worked toward a pension and I do not ever recall that I was promised cost of living increases for that pension. I always had to find a way to retire knowing that inflation WILL HAPPEN and I just hope it will be at a small 2-3% rate. COLA was another vote buying tactic. No,Dwayne, you missed my point – My 1974 wage of $2.85 = $14.85 buying power in 2017. That is not a single item of the CPI – it is a fact the CPI and the minimum wage has not kept up with price inflation period. No wonder the young in this country are having to move back in with their parents. Minimum wage increases do not cause inflation or job loss. If that was true every time any group received a pay raise jobs would be lost. Companies adjust workforce levels all the time for many different reasons. Minimum wage yes, but how can you say the CPI has not kept up with price inflation when it is made up of the cost of goods and services? The bulk of minimum wage workers are very young and part-time not breadwinners or families. Rising wages need to be offset by increased productivity but that is not happening, plus many higher wage jobs are going away and will never return. Because the CPI is an average of prices and not everyone buys the same stuff or services, it has not kept up with many of the costs. Healthcare, autos, and homes have all increased higher than the CPI averages. Any index that covers the entire nation by definition will be high for some areas of the country and low for others. I was reminded in March what a difference twelve hundred miles can make. I traveled to Arizona for the first time. Housing in the Phoenix area is about half of the Seattle area where I live. Food in grocery stores slightly cheaper. Gasoline ten per cent cheaper. One thing was more expensive in Phoenix: home energy costs. RD – I have tracked my costs and rent is up 86%, (it went up 5% in 2016 when we received no COLA), Food is up 100 % to 200% depending what you buy. New cars are up over 100% So, you cannot say 60% COLA is getting the job done, over the last 20 years. I watched in 2015 when we received the 1.7% COLA. I went to Sam’s Club on the 3rd of Jan and the price of Milk, Eggs, Bacon, Coffee, and Bread all had price increases from the week before. I saw this when I was in the USAF, every time we got a COLA the price of haircuts went up at the base exchange. I do not know what system would be any better, but the CPI is not working for many families. Lies, Damned lies and statistics. Sure your numbers match up with what the government says is the price inflation. But it covers some things that many of us do not buy, that lowers the figures. Who cares if electronics prices go down, but you have a house full and are not buying any more electronics. But food, healthcare, utilities and rents have gone up way more than the inflation numbers show. Since I am retired I do not buy more than one tank of fuel per month, sometime a lot less, if I use ecommerce. So, low gasoline prices do not help me very much. Even with the low gasoline prices, gasoline cost $1.15 per gallon in 1995 and today it is $2.40, that looks like more than a 60% increase to me. You can pick and choose the items you want to include or exclude. It doesn’t work that way. Even using the CPI-E for elderly doesn’t change the result by much. The reason it does not change the results, is it is a flawed way to track the true cost of price inflation and how it impacts the average family. It only takes a few high cost items to crash a budget. Healthcare, food, car repairs, education expense, rents, have all been going up faster than the CPI – I know I have lived it. If you are on a fixed income no COLA is ever going to keep up with true price inflation. I spend more today feeding 2 people than I did feeding 6 back in 1995. All of those items are part of what comprises the CPI that’s what it measures. Of course you spend more on food, etc. than in 1995, that’s why the CPI has gone up 60%. If the CPI/COLA doesn’t keep up with increasing costs, what measure will? You have to look at the buying power when trying to look back at historical pricing. In 1981 the federal minimum wage was $3.35 and a gallon of gasoline was $1.31 according to the Internet research. ( I seem to remember it being closer to $1.50 gallon). In today’s dollars that is $3.51 per gallon and that is a total budget buster for me in 2017 if it were to go that high again. $1.31 per gal was 39% of the hourly minimum wage for 1981. As you pointed out, today gas is $2.40 a gallon which is deflation so maybe they should take money away from the COLA. Today’s federal minimum wage is $7.25 and gasoline at $2.40 per gallon makes it 33% or 6% less. You can actually buy 25% more gas for the same hour worked today. In 1980, look at the mess the world was in. Hyper-inflation in the USA, Iraq-Iran war, 8 years dealing with OPEC. Look at the world today. The USA is a leading oil exporter not an importer. The world has changed. Costs and markets have changed. Don’t even get me started on the cost of telephone plans. They have sky rocketed and you also have more services and cell phones. Or have the prices skyrocketed? Does anybody still pay toll changes for calling out of your area code? Internet and cable costs / choices anybody? You have to pick some kind of metric and stay with it even if a few things go up and down over time, because the world changes.